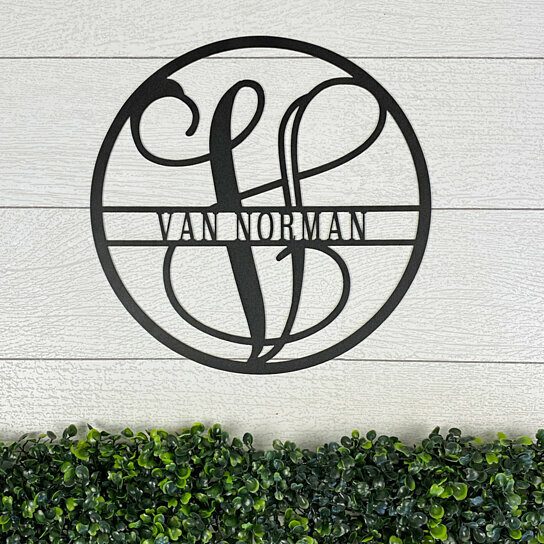 Circle Vine Monogram and Family Name - 11.5", 14.5", 18.5", or 23.5"
Please select an option 11.5 14.5 18.5 23.5 Please select a Size. This versatile design looks great anywhere! The metal material allows this sign to be hung outdoors with no rust, and indoors too. Looks great in a family room, on a front door, on a barn, and just about anywhere! This item does not come with mounting hardware. Disclaimer: IF YOU LEAVE OUT YOUR INITIAL, WE WILL USE THE FIRST LETTER OF THE NAME YOU ENTERED!